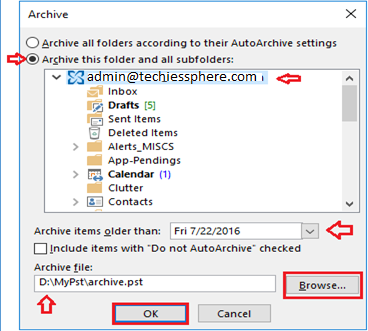 Techies Sphere: How to Archive MS outlook emails? How to Archive MS outlook emails? Or, Archive outlook emails in to .PST. Or, Why to archive outlook emails when the mailbox size increases? Descriptions: Is your outlook email very slow overall than usual? If yes, the outlook data size is one of the very common factor which affects outlook performance. 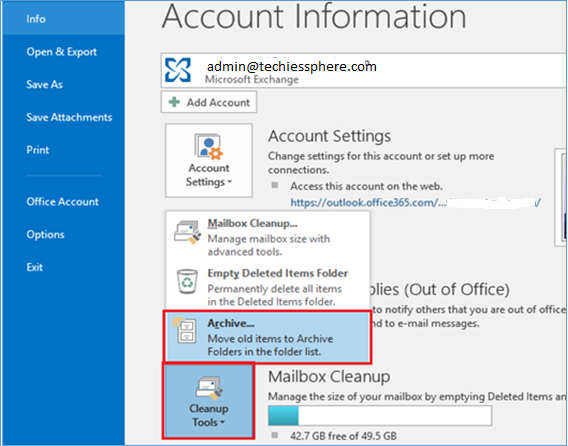 It’s very important to consider a regular email archival if you are using outlook emails in exchange server environment. If the archival is not done for long, then the .OST files size get increased. Every time you open outlook or perform any email operations, outlook takes lots of time to get everything checked and processed. To archive your emails, please follow the steps sequentially as given below. 1. Open Outlook and go to File menu as highlighted below. 2. Click on ‘Cleanup Tools’ and Select ‘Archive…’ option. 3. Select ‘Archive this folder and subfolders:’ > make sure your complete mailbox is selected, not only the inbox > Select a desired date in ‘Archive items older than:’ section (good to archive emails older than 3 months) > Click on Browse and Select a path, preferably other than C:\ drive > Click on ‘OK’ to begin the archival process. Please Note: it may take longer to complete the archival depending on the current email data size of your mailbox. yourusername@yourdomainname.com folder contains current emails and ‘archive’ folder contains emails you have archived.